Strings are loop end (like banjo or mandolin), .023 wound, .014 plain, .010 plain. 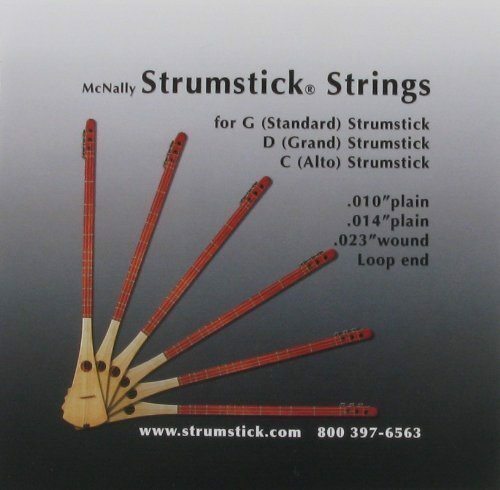 These strings work for any and all 3 string Strumsticks ( Standard, Grand, Alto, Long Scale 3 str. Chromatic). .023 wound, .014 plain, .010 plain. These strings work for any and all 3 string Strumsticks ( Standard, Grand, Alto, Long Scale 3 str. Chromatic). Always good to have spare strings, and if you don't have a convenient source of the banjo-type strings this instrument needs, then it's a good idea to order one of more sets of these. Why bother searching around for the various string sizes? For $6.00 get the right ones! Great string set for my Strumstick. Beats having to buy all the strings separately. No issues.